HE Mattar Al Tayer, Director-General and Chairman of the Board of Executive Directors of the Roads and Transport Authority (RTA), has honoured sectors, agencies, firms and individuals selected as winners of the 7th RTA Safety Award 2015. The Award, which is presented annually to recognize the best safety practices of all RTA processes, aims to honor the best consultant, contractor and workers who demonstrate compliance with the occupational safety standards across all the projects & construction sites within the RTA. Categories of the Award also include the best sector/agency and the best health, safety & environment (HSE) team in the RTA. Three more categories were introduced in the last edition namely: Best RTA Safety Initiative, Best Public Transport Driver, and the Best RTA Maintenance Team. The award distribution ceremony, which was held at Al Wasl Auditorium at RTA premises, was attended by a host of CEOs of the RTA as well as representatives of government departments, contractors and consultants. Al Tayer awarded agencies, sectors, firms and individuals winning various categories of RTA Safety Award 2015. CH2M was selected as the winner of the Best Safety Consultant Award. China State Construction Company won the best safety consultant award (large enterprises), and Al Shafar Contracting finished second. In the Medium Enterprises category, the winner was United Motors & Heavy Equipment Trading LLC, and the runner-up was the Dubai Driving Center. In the category of the best worker of contracting firms, Patel Ranchwood from Belhasa Engineering was the winner, and the runner-up was Papu Powel from ServeU LLC while Eng.Maitha bin Adai, CEO, Traffic and Roads Agency won the Best RTA Safety Leader award. Among the RTA agencies, the Rail Agency won the Best HSE Team award, and the Public Transport Agency came second. 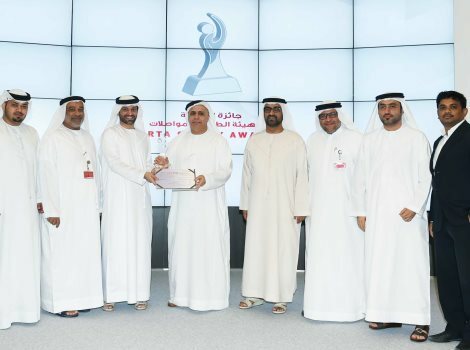 Among RTA Sectors, the Corporate Technology Support Services Sector won the Best HSE Team award. As for initiatives, the Prevention of Accidents initiative of the Public Transport Agency was the winner, followed in the second place by Removing Heavy Vehicle Faults System initiative of the Licensing Agency. The Fleet Maintenance Team at the Dubai Taxi Corporation won the Best Maintenance Team award category, and the team of the Traffic & Roads Agency came second. In the Best Public Transport Driver category from a safety viewpoint, Dhia Allah Khan Kamel Khan, from National Taxi company, was the honoured as the Best Taxi Driver, and Abdul Aziz Shakiri from Bus Department, Public Transport Agency won the Best Bus Driver award. Ahmed Mosmogino, and Irfan Padualli from the Marine Transport Department, Public Transport Agency won the Best Marine Transport Means Driver award, and Abdul Nazeer Moaidotti from the Rail Agency won the best Tram Award. Al Tayer also honoured the Chairperson and Members of RTA Safety Award Team. Al Tayer confirmed that the compliance with health & occupational safety standards in RTA’s projects is one of the core values which cannot be waived or compromised under any conditions. “All projects designed and implemented by the RTA conform to the highest levels of safety & security. During the construction process, RTA projects are subjected to a comprehensive assessment to verity the compliance of constructional processes with the global standards of projects occupational safety,” he said. “The Safety Award is one of the ground-breaking initiatives of the RTA for honoring contractors, consultants and strategic partners contributing to the enrichment of good practices of health, safety & occupational safety. “The Award, which was launched in 2009, aims at creating awareness amongst the public & community organizations about the importance of safety, and enhancing the role of partners in supporting RTA’s projects & activities. It also renders the concept & practices of occupational safety an overriding priority of organizations in the public and private sectors. “The Award saw sweeping changes in the number of categories from just four in the inaugural edition covering contractors & consultants engaged in RTA’s projects only. In the second round the Award covered contractors and consultants working with RTA’s agencies and sectors. In its past edition, the Award saw the addition of new categories bringing the total number of categories to eight. Next articleمحمد بن راشد يزور هيئة الطرق والمواصلات في دبي.